The Great Labor Split 1955: Fifty years later was held at Parliament House, Melbourne. Friday and Saturday 15 and 16 April 2005. It was sponsored by the Melbourne Branch of the Society for the Study of Labour History and The National Centre for Australian Studies, Monash University. 2005 was the fiftieth anniversary of the Split in the Australian Labor Party which shaped Australian politics for a generation. 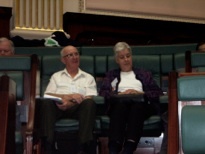 To recognise and assess the historical significance of this event there was a conference in the Legislative Assembly Chamber of the Victorian Parliament- the scene of the fall of the Cain Labor Government in April 1955 – held on the 15th and 16th April 2005. The Split was a traumatic event in the lives of many Australians : it divided not only former political allies and trade unionists, but also split Catholic from Catholic, friend from friend and even rent individual families. It was a period of high drama, dwarfing even the 1975 Constitutional Crisis for the passions and enmities it created and sustained for years afterwards. Topics discussed at the conference included the political, industrial, religious, ideological and personal aspects of the Split. And much new material and interpretations was presented in areas such as: the April Fools’ day plot against Evatt; the role of personalities such as B. 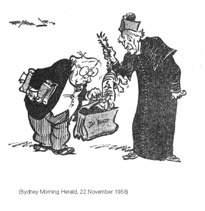 A Santamaria, Archbishop Mannix, John Wren and Frank Hardy; the Catholic Social Studies Movement; the Industrial Groups; the Royal Commission on Espionage; the nature of the Split in different States; how the media reported the Split; the Catholic Bishops and the Split and the Liberal Party and the Split. Special attention was given to the long-term consequences of the Split including assessments of the Democratic Labor Party and the ‘closure’ of the Split with the 1970 federal intervention in the Victorian ALP and much more. The conference was opened by John Cain jnr, the son of the Premier who lost office because of the Split, and himself the first Labor Premier of Victoria since 1955. Other speakers Included Frank Bongiorno, Cathy Brigden, Frank Cain, Anthony Cappello, Rodney Cavalier, Brian Costar, Bruce Duncan, Greg Gardiner, Murray Goot, Jim Griffin, Peter Hausler, Tim Hayes, Jenny Hocking, Stephen Holt, Noel Lloyd, Peter Love, Judy Maddigan, Race Mathews, John Roskam, Malcolm Saunders, Paul Strangio, Bill Tully and John Warhurst. 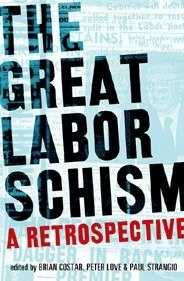 Two terrific features of the conference included: the launch of Brian Costar, Peter Love and Paul Strangio eds., The Great Labor Schism: A Retrospective, Scribe Publications, 2005; and the premiere of Pat Laughren’s Documentary Film The Split: The Struggle for the Soul of the Australian Worker. It is worth noting that Dr.Mannix opposed Menzies’ Communist Party Dissolution Bill. He thought that the Bill was totalitarianism and this was worse than communism. He is also on record in 1920 as saying that the Treaty of Versailles would lead to a greater war than the one just waged. Is there any possibility of attaining a copy of Pat Laughren’s Documentary? I would love to have a watch.